Republicans accomplished a feat this past week that had eluded them for more than three decades—a sweeping overhaul of the U.S. tax system. Passed through the Senate and House on party lines, and celebrated outside the White House by Republican legislators and the president, the bill is less popular with the American public. According to a recent CNN poll, only 33 percent favor the GOP’s proposed tax code. On the other hand, an earlier survey by Paychex, a payroll and HR solutions company, found that tax reform has a more favorable rating among the small businesses it was intended to stimulate. RewardExpert spoke with Mike Trabold, Paychex’s Director of Compliance Risk, about the survey results. The Paychex Small Business Survey last month examined the opinions of 307 principals of U.S. companies with 1-500 employees. 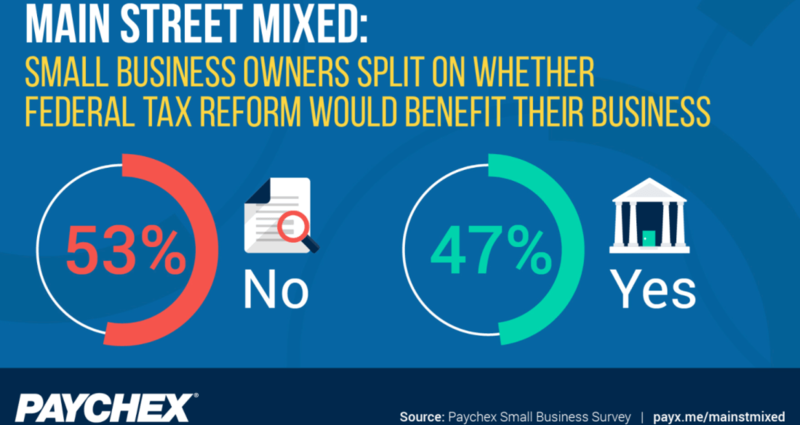 Among the results: 47 percent of small business owners felt federal tax reform would benefit their business finances. Fifty-three percent did not. When asked why small business owners were split in their opinion of the GOP’s plan, Trabold explained that it was possible some were hesitant to express optimism until the final bill could be revealed. Among the 47 percent of small business owners surveyed who were optimistic about the possible impact of tax reform on their business, 86 percent said they believed it would help them increase profits. Other benefits cited included the ability to invest in more resources such as equipment and technology (79 percent), save time (67 percent), increase wages (65 percent), and hire additional staff (57 percent). Optimistic small business owners also thought that tax reform would even their playing field with competitors (57 percent) and allow them to add more locations (47 percent). Trabold believes that the lower top personal tax rate, corporate tax rate of 21 percent, and 20 percent income deduction for pass-through businesses included in the tax reform bill will benefit a lot of companies. Founded in 1971, Paychex now provides more than 600,000 clients with payroll and payroll tax services, benefits administration and compliance services, insurance and more. To learn more about the solutions Paychex offers businesses with one to 1,000 or more employees, visit www.paychex.com.